Melanie offers to do the ironing in order to get back into Matt's good books but he's still upset – getting his licence was so important to him. She offers to drive him anywhere but he moans she barely knows her left from right. Melanie protests that she's never had an accident and her dad even leant him his car all the time! Matt isn't convinced so she tells him she'll sit in with him while he drives. She'll go anywhere he wants to go. She'll commit to him like in the Bible – ‘whenever you go, I go'. Matt is surprised she knows any of the Bible but Melanie recounts the time she was stuck in a hotel room for a weekend, with only the Bible and the phone book for company. MELANIE: You know I really felt sorry for that woman who turned into salt. I mean, what was going to happen when it rained? It's bad enough when your mascara runs. Matt laughs and Mel takes this a sign he's not mad at her anymore but Matt disagrees. Joe is looking forward to reading Harold and Madge's interview. He wants to see what lies they've told (as that's what politicians do). Madge denies she lied and Harold thinks she's implying he did. 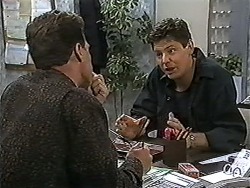 Paul arrives with a proposal for Joe; he needs someone to tend the indoor plants at Lassiters. Harold thinks he might be feeling a tad guilty for firing Joe over the children's playground affair. Paul just thought he'd be interested and will only take the best quote – no favouritism here. Joe promises to draw something up for him. Before he leaves Paul advises Harold to be a little more tactful – he won't win many votes otherwise. 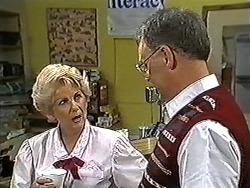 Jim confesses to Helen that he's worried about Beverly; he thinks she doesn't want a reconciliation. Every time he talks to her, he gets nothing back. It's like she doesn't even want to try. In addition to that, Ewan is hanging around all the time. 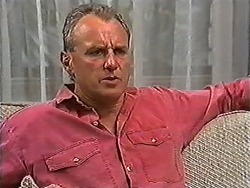 Helen tells him his suspicions of Ewan have done a lot of harm. Jim thinks he has a right to be suspicious – they were going on a picnic together! 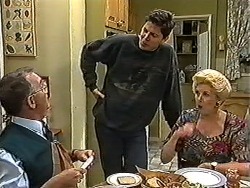 Helen encourages him to make the effort to talk to Bev but Jim isn't sure it's worth it; maybe he should let it go. Helen tells him not to talk nonsense; he knows he doesn't mean it. Jim says nothing. Ewan has just finished reading Bev's report and all indications are her mind is on other things – it's chock full of mistakes. He asks her out for dinner – she's been under a lot of stress and it's time she had a break. But Bev doesn't think going out for dinner will stop her thinking about her marriage. Ewan says that if her marriage is over then there's no point in brooding about it and that's what will happen if she stays here. He's just trying to help her. He kisses her once and then they kiss again, passionately! Joe wants some details from Paul before he does the quote. He also wants to sound out the competition and Paul says there's one he's looking at. Joe tries to find out how much they're offering but Paul doesn't think that would be fair. Leaving Paul's office, Joe tells Melanie how surprised he is at the other contractors quote – it's so cheap! Mel doesn't think it was that cheap. Joe clarifies; he just that he would've thought it would be more expensive. Mel looks out the quote and tells him $1000 a month isn't that bad. Joe thanks her and makes a quick exit. 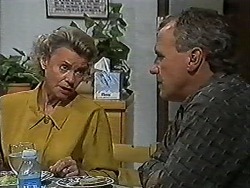 Melanie asks Paul why Joe would want to know laundry costs. He seemed so impressed with this one! Paul deduces he might've thought it was something else and assures Melanie that she hasn't made a mistake – in fact she's done just fine! Kerry is over to see how Beverly is coping. Bev says Jim blames her for Todd's behaviour and Kerry asks if they're any closer to reconciling. Bev admits they aren't and she isn't even sure if she wants to get back together. She sees him in a different light since this business with Todd. Kerry reminds her that he's under strain too but Beverly thinks that's not the half of it! She'd be a right mess if she didn't have Ewan to support her. Kerry ventures that her affection for Ewan might be leading her to feel this way about Jim. Bev admits to wondering what life would be like with Ewan. Kerry asks her if she's considering leaving Jim for Ewan. BEV: I guess that is the bottom line. Helen is off home to do some painting – she's been inspired ever since she found that painting. Paul knows she loves it and deduces that she hasn't tried to find the owner as she doesn't want to lose it. Moving onto business, Paul tells her about Joe's mistake with the quote. He laughs as he thinks of poor Joe racking his brains to find a way of doing the job for less. Helen thinks he has to tell him the truth but Paul says if Joe wants to give a quote for under $1000, he'll damn well take it. Helen says it isn't honest and Paul points out that keeping a painting that doesn't belong to her ain't exactly honest either. Jim and Matt come in. 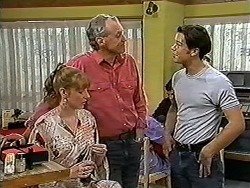 They have a quick chat with Harold who can't wait to read his Erinsborough News interview. Melanie is sitting as they chat about what needs done at the workshop. They need to pick up some spare parts and some tricky work needs done too. An inexperienced Matt would rather pick up the parts but he can't without his licence. 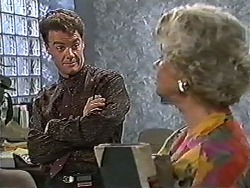 Mel looks guilty and tells him she can take him during her lunch hour. Matt isn't so sure - it'll take more than this for her to make it up to him. Nonetheless he takes up her offer. Joe can't meet the quote for Lassiters. Kerry thinks that he might just simply not be able to do it as cheaply as a well established company. Maybe it's not worth going into; she's starting to sell things, so they'll be okay. But Joe won't let it beat him. Later on Madge is round and worried about her campaign. Kerry assures her she isn't out of her depth. What she should do is take up some worthwhile causes – she can introduce her to some women who need her help. Madge is ready to try anything. Beverly feels like a visitor. Helen tells her that this is her home and not to think otherwise – they can't wait to have her back. Helen asks if Todd is being a handful and Bev is uncertain he'll snap out of it soon. 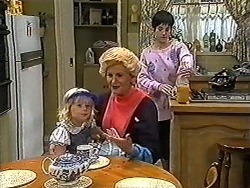 Beverly asks Helen if Jim still wants to save their marriage. Helen can't say; she has to talk to him herself. She won't be the Go-Between. Beverly complains that he's being so difficult. Helen thinks they both are. Madge complains to Harold about the cost of her leaflets and posters. Harold isn't pleased to hear she's paying for it from their joint account. Madge says she's entitled to the cash. Harold thinks the mere fact she has no supporters to pay for them means her campaign is a bit of a joke and suggests she pull out. Madge says he'll be wearing her coffee if he says another word. She will get support! HAROLD: Yes, dear, of course dear. Whatever you say, dear. Paul is dictating to Melanie when Matt turns up looking for a lift home. Paul lets Mel leave early. Matt has a long list of other times he needs her to sit with him – but Mel has something on tomorrow night. Matt knew she wasn't going to keep her promise. Melanie assures him she'll stick to it. Matt smiles as she dashes out ahead of him. 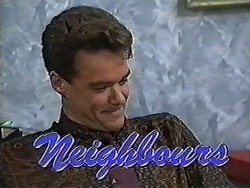 Jim returns home to find Beverly. She's realised they haven't made a concerted effort to solve their problems and suggests they see a marriage guidance counsellor. Jim doesn't like the idea. They're not the sort of people who need such a thing. Beverly thinks they are – they haven't managed to do much themselves. She asks him to think about it if he wants to save their marriage, like she does. As she leaves, she tells him to call her when he's decided. Joe comes in with a quote. Paul looks over it and remarks that it's lower than any other he's been given. If he's sure he can do it for this price, the job is his. Joe plans to get right on it. Paul reminds him that this contract is binding and he can't go putting up the price later on. Joe understands. Paul shakes his hand and laughs to himself once Joe has left.